Entertaining and Educational Pirate Music for all ages - in a variety of styles and moods - with boatloads of wordplay. I am so proud of this album! It's a 28 song collection with over 65 minutes of music. This collection sails the seas from Blues to Bagpipes, from dance mix to line dancing the directions on a ship, from Celtic punk to nursery rhyme parodies, and from instrumentals to a spoken word finale. "Shark in the Dark" is the monster hit - a song requested by kids and adults alike. "Eight Pieces of Eight" has more than eight references to the number itself, with a bit of math added in. "Without the R" shows what happens to some words when they loose the letter R. Oona Uni-hook is about a pirate unicorn that realizes it is OK to be different. A crew of musicians and friends, lead by my Producer Andre Maquera, have helped me create an album rich in musical textures, moods and meanings. Natalie Reed has drawn characters from my other albums and now she has put her award winning talents to the creation of the cover art. 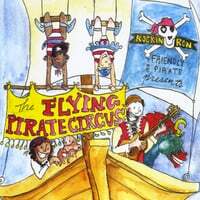 I hope you'll join the crowd at "The Flying Pirate Circus". My interactive and sing-along songs have boatloads of wordplay and nautical references delivered in a wide variety of styles. Topics include language (Give Me an RRR!, The Word Pirate, Without the R), history (Pirates & Privateers, 1717, Blackbeard's Blues, Feats of Jean Lafitte), special occasions (Pirate Birthday PaRRRty, Buccaneer Bells, Mother of Pearl), and values (Seven C’s, Friend Ship, There are Tall Ships). My characters Pearl the Purple Pirate Princess, Oona Uni-hook, Scurvy Dog, Scaredy Cat, Polly Esther Pants, Mud Puddle Pirates, and Cranky Pirate are easily relate-able. My approach is Sesame Street meets Monty Python.